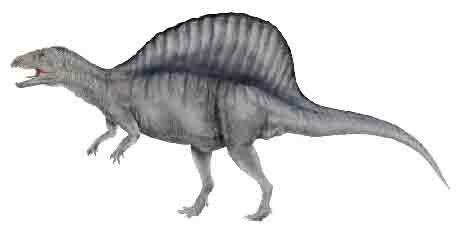 Spinosaurus (“spine lizard”) was first discovered in 1912 by Richard Markgraf in Egypt, and was described by Ernst Stromer in 1915. Spinosaurus was the largest known terrestrial carnivore in history, measuring in at about 13.4 m (43.9 ft) in length and up to seven tons in weight; however, some estimates place the maximum size of Spinosaurus aegyptiacus at as large as 18 m (59 ft) and 20 tons. Spinosaurus lived during the early Cretaceous, approximately 122 to 97 million years ago, in northern Africa; S. aegyptiacus lived in what is now Egypt, and another species described in the 2000s, S. maroccanus, lived in Morocco. The animal’s most distinctive feature is tall sail on its back, for which it is named. These spines were long extensions of the vertebrae, growing as high as 1.65 m (5.4 ft). These spines are inaccurately depicted in the Jurassic Park franchise; the sail starts at the scapula and ends at the hips, but the real animal’s spines were tallest at the hips. The actual purpose of these spines is unknown, much like the plates of a Stegosaurus; various theories suggest that it may have been used as thermal regulation, sexual display, or as support for a hump that stored fat, much like the modern American bison. Spinosaurus was (purportedly) not on any official InGen species list, and was cloned by InGen under Masrani Global in 1999 after the former’s acquisition by the latter in 1997. The introduction of the species into the established Isla Sorna ecosystem caused considerable chaos, and threw Isla Sorna’s population into imbalance. This imbalance caused a population drop that coincided with a number of species returning to extinction. Spinosaurus could be found on Isla Sorna before it was moved to Isla Nublar to be housed for a future attraction. The animal died in captivity and its skeleton was mounted and displayed in the Main Street of the resort. As of 2018, the Dinosaur Protection Group had determined that the Spinosaurus population was extinct once again. In 2001, a Spinosaurus was encountered several times by a rescue team searching for Eric Kirby after he was stranded on Isla Sorna during a paragliding accident eight weeks prior. 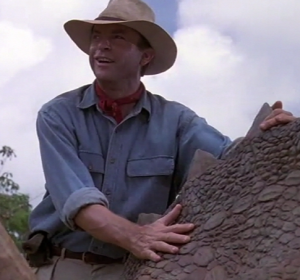 After escaping from the dinosaur, Billy Brennan tried and failed to identify it (suggesting Suchomimus and Baryonyx) before Dr. Alan Grant correctly identified it as Spinosaurus aegyptiacus, observing that it wasn’t on InGen’s species list and wondering what else was on Isla Sorna that InGen never told them about. Presumably, it was the same Spinosaurus that Grant and company encountered outside the aviary and at the river. 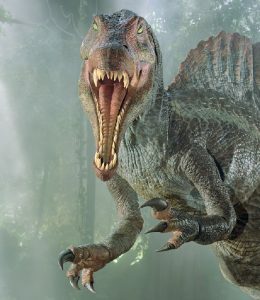 Spinosaurus was a relatively misunderstood dinosaur until 2001; it is possible that InGen either did not recognize the animal as a known species or misclassified it as a Baryonyx. A reason for this is that the original fossils of Spinosaurus which were discovered and described in the 1910s were destroyed during bombing raids on Munich, Germany, in 1944, where the fossils were on display at a museum. Until recently, Spinosaurus was believed to have a skull shaped more like a quintessential carnosaur rather than resembling a Baryonyx with a spine. Recent studies on Spinosaurus in 2014 show us a different kind of animal altogether. The new Spinosaurus material changes our understanding of this fascinating animal and turned it into an probable quadruped that spent most of it’s life in deep water hunting for fish. While science has marched on and changed our point of view on Spinosaurus, InGen’s creation is locked in a previous version of the animal. Just another example of InGen’s genetic manipulation. As such the Spinosaurus seen in 2001 was (possibly) more powerful than the actual animal was, though possibly smaller given the maximum size projections of the real Spinosaurus. 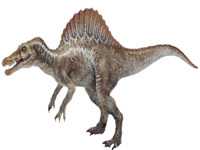 Some fans have speculated that the Spinosaurus seen in 2001 is actually a sub-adult, based on its size; the age of the Spinosaurus may also be a factor in its aggression. As to the Spinosaurus origins, it is possible that infant Spinosaurus may not have had as prominent of a sail at birth, which may have led InGen to misclassify them as Baryonyx. As such we’ve granted the name of Spinosaurus aegyptiacus “hammondi” after John Hammond in memoriam as the character and the actor, Lord Richard Attenborough, are no longer with us. We felt this was a fitting tribute to name one of the most powerful dinosaurs on the island after the character.